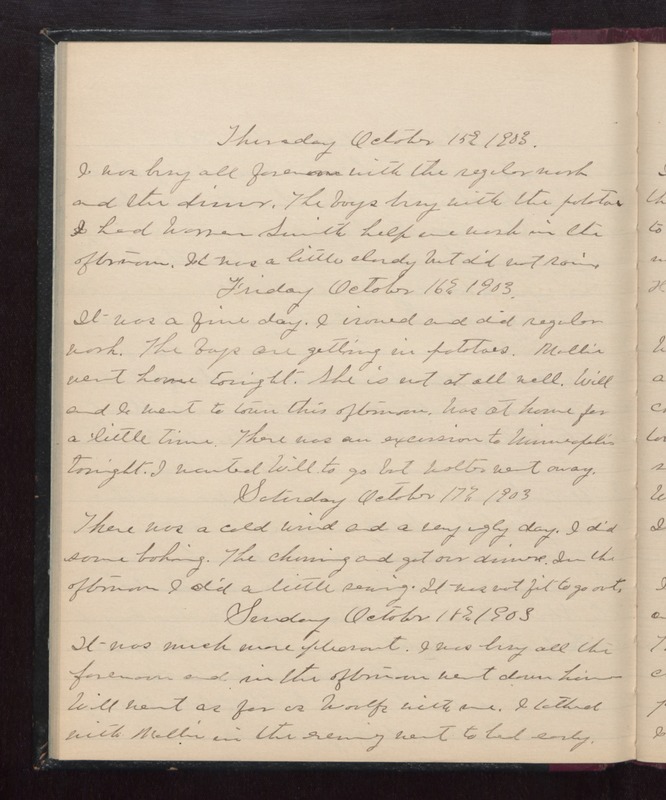 Thursday October 15th 1903 I was busy all forenoon with the regular work and the dinner. The boys busy with the potatoes. I had Warren Smith help me wash in the afternoon. It was a little cloudy but did not rain. Friday October 16th 1903 It was a fine day. I ironed and did regular work. The boys are getting in potatoes. Mollie went home tonight. She is not at all well. Will and I went to town this afternoon. Was at home for a little time. There was an excursion to Minneapolis tonight. I wanted Will to go but Walter went away. Saturday October 17th 1903 There was a cold wind and a very ugly day. I did some baking. The churning and got out dinner. In the afternoon I did a little sewing. It was not fit to go out. Sunday October 18th 1903 It was much more pleasant. I was busy all the forenoon and in the afternoon went down home. Will went as far as Woolfs with me. I talked with Mollie in the evening, went to bed early.